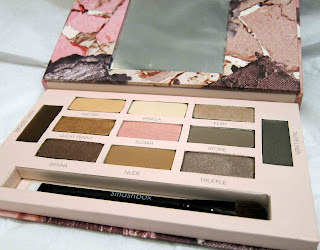 THE SKINNY: I picked up Smashbox's Softbox Eye Palette during a holiday sale at Sephora for $25. I think I would be a little upset if I had spent the full $48 -- mostly because even with primer, this makeup doesn't stay put for very long. This palette contains nine eye shadows in light neutral shades -- a matte peach, matte ivory, pink beige, copper, pink, matte taupe, shimmer taupe, warm bronze and matte caramel -- plus a taupe and a bronze cream eye liner. The colors are subtle and a decent neutral variety. My go-to palette is Urban Decay's Naked 2, which contains a lot of gold-toned shadows. Smashbox's offerings, by comparison, are pinker hues. They're light, but not so light that they don't show up on my fair skin. I like the creaminess of Smashbox's shadows, and they tend to go on nice and thick -- which I think is great with this color palette. But no matter which primer I try, the shadows do wear off rather quickly. Don't even bother with the cream liners. It always seems to be gone by the time I walk out the door. This palette does come with a nice, double-sided brush and a sample of the Photo Finish Lid Primer in warm beige, both of which I loved. KEEP OR TOSS: Keep, but be prepared to reapply often. CHECK IT OUT: This palette is sold at Sephora.